These two maps are designed to show what was here before the housing estates were built, and also what remains of this. 1834 when the whole area was known as ARLE. 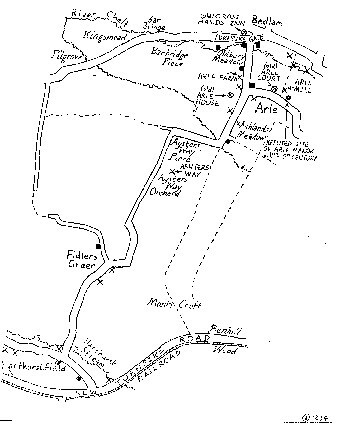 This shows some of the field-names - those from which more recent road-names have been derived. 1938 shows the area just before major redevelopment began, when Arle and Hesters Way were two rural hamlets. It shows every house that stood beyond Brooklyn Road at the edge of town. Unfortunately there is not space here to name all the houses. (Also, some house-names have changed several times over the years). HOW OLD IS YOUR STREET? Not all of Hesters Way is new, nor had history stopped of course. It may seem odd to think that most of the houses in Hesters Way are older than the people living in them. For example, many parts of the 'modern' Springbank Estate are already over 30 years old. 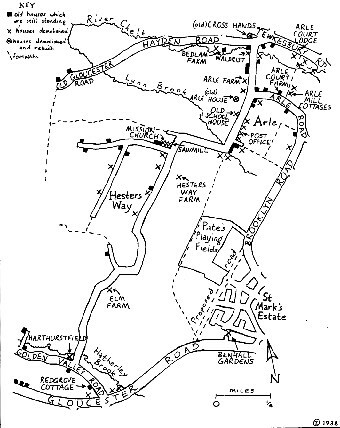 The following roads are medieval (or older):- Old Gloucester Road/Hayden Road, Tewkesbury Road, Village Road/Tanners Lane, Kingsmead Road/Arle Road, Pheasant Lane. The Old Gloucester Road became turnpiked (i.e. made a toll road) in 1756; however, it was never well surfaced and the present Gloucester Road by-passed it in 1810. Traffic taking a short cut between these two roads made a highway out of some minor farm tracks. These tracks are now Hesters Way Road and Fiddlers Green Lane. Local landowners constructed some new gravel tracks in the area about 1869 to encourage smallholdings or market gardens to develop alongside. These tracks have now become the roads called Hesters Way Lane and Springbank Road. Brooklyn Road and the geometric horseshoe of roads around Tennyson Road were laid out in 1921, although the housing took until 1938 to finish. In 1938 a new housing estate began to spread into the fields beyond, along Orchard Way and Tanners Road. Because of the war, building here stopped in 1940. Building recommenced in 1951 when Princess Elizabeth cut the first turf for the road named after her. Roads with Council housing generally dated from 1952-1957, whilst the blocks of flats tended to be a little later, rounding up with Sochi Court in 1965. More details are in the opening chapter. Some small private developments date from the early 1960's, e.g. Kingsmead Close. The main Springbank Estate, (all the roads off Hesters Way Lane and Springbank Road,) date from 1965-74. Glynbridge Gardens and George Readings Way estates date from 1974-78. The estates off Fiddlers Green Lane date from 1977-88. The north end of Springbank dates from 1982 onwards, with building in 1999 still continuing. A few short roads have been squeezed into undeveloped corners. These roads are around 10 years old:- Waldrist Close, Ashlands Close, St. Aidans Close, Dunster Gardens, Marchant Close and Newton Close. The newest developments off Shakespeare Road were built in 1998.